AQ SmartSpeaker streams from AirPlay, Android or Windows devices | What Hi-Fi? 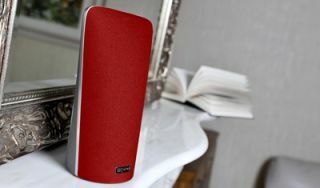 AQ Audio has unveiled a speaker that can stream over AirPlay from any Apple device or iTunes library, without the need for a wireless network connection. Mind you, it's not the first company to do so: Klipsch's G-17 Air iPhone dock also has Wi-Fi Direct. Still, the AQ SmartSpeaker Wireless + Portable, to give it its full name, can also stream from Android and Windows 7 devices in to the bargain. And at £159, it certainly sounds like decent value already. The company's AQ Direct technology is the clever bit, allowing you to stream over AirPlay even when it is outside of your wifi network's reach, such as in the garden, on holiday or round a friend's. Thanks to an integrated battery, the SmartSpeaker can run for around 10 hours in AirPlay wireles mode. It's not just Apple AirPlay devices either. Using the soon-to-launch AQ Play app for Android, available for free via the Google Play app store, you will be able to stream to the SmartSpeaker from Android devices, too. And again, streaming from Android devices will work outside of your home and doesn't require a wi-fi connection. Last but not least, Windows 7 and above compatible devices can also stream using the Microsoft 'Play To' feature. You can connect two SmartSpeakers together and set them as a stereo pair or have multiple speakers to form a simple multiroom system. A twin pack of AQ SmartSpeakers will cost £299 and a four pack is £579. In to the bargain, AQ Audio is also offering a 40% discount on the Rogue Amoeba Airfoil app, which allows you to wirelessly stream any audio to the speaker from your computer. The SmartSpeaker Wireless + Portable is available now for £159 from AQ Audio.